This blog post is the first part of two by, Dr Christopher Bennett, Research/Teaching Fellow in Flight Test and Applied Dynamics, at Cranfield University. Since Dr Jim Nixon's blog on search and rescue (SAR) trials at sea in December 2018, the team has conducted two further full-scale trials - this time at night. The phrase “Respect the water”, used in a recent Royal National Lifeboat Institution (RNLI) advertising campaign, has become increasingly relatable to me during my recent adventures as part of Cranfield University’s Crew Immersion Suit Conspicuity (CIMSCY) project. This research, funded by the European Aviation Safety Agency (EASA), is aimed at increasing the visibility of casualties at sea in the event of an aircraft accident. Since the last blog on CIMSCY, written by Dr Jim Nixon, the team has conducted two further full-scale search and rescue (SAR) trials at sea, this time at night. The first was in Swansea bay off the south Wales coast in early February. The second was off the coast of Stornoway, Isle of Lewis, in mid-March. It’s fair to say that conducting these trials over the winter months was not always comfortable, but it gave us some much needed variation in weather and sea conditions – more on this later. To recap, these trials test, in an as realistic scenario as possible, a modified pilot immersion suit, in parallel with the current regulation Survitec 1000 Series suit. The modified suit had additional visibility support by means of retro-reflective tape, positioned in areas of the body most likely to be visible from the air during a search and rescue mission. The suits were to be demonstrated by our assistants ‘Dead Fred 1’ and ‘Dead Fred 2’ (affectionately named training dummies) out at sea, and Bristows SAR crew would take to the air in their specially modified helicopter and search as they normally would for a missing person. At night, this involves the pilots using night vision goggles (NVGs) and the rear crew using a camera system called FLIR (Forward Looking InfraRed), in conjunction with powerful searchlights. We hoped that Fred 1, wearing our modified suit, would be visible from a greater distance, and hence increase the probability of detection. In order to support this claim, we required repeat data in a range of sea and weather conditions. Clearly, such trials require meticulous planning and the help of a dozen people or more, plus the use of their very expensive kit. We have to say that the Bristows SAR crews at St Athan and Stornoway, the RNLI at Port Talbot and Stornoway, and the guys at Stornoway Seafari, are all tremendously supportive. Having said that, it was clear that the nature of the research is what drove their motivation to help out - “if it has potential to make it easier to find missing people at sea, and could someday save someone’s life, we’re all for helping out” – Clive Morris RNLI Port Tabot. 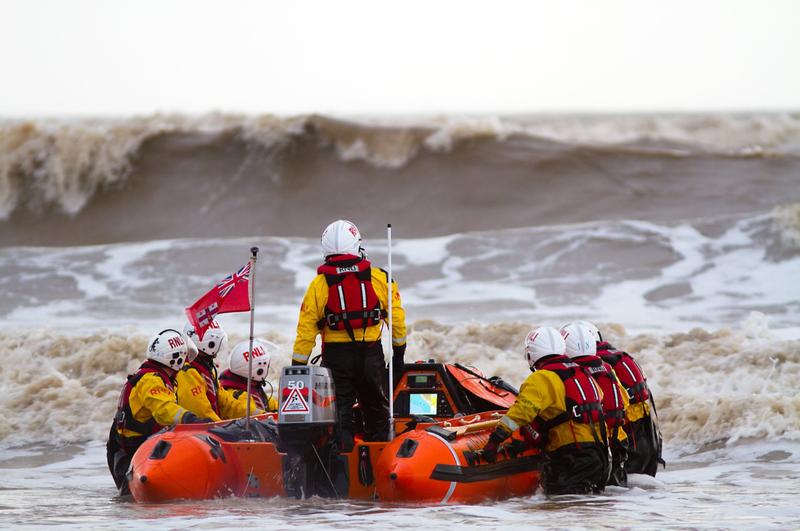 Our first planned trial would take place in Port Talbot, south Wales, with the help of Bristows SAR St Athan and Port Talbot RNLI. On the afternoon of our arrival, we met with the RNLI operations manager Clive Morris for coffee in a popular coffee shop on the Port Talbot promenade. We confirmed the go-ahead for the trial the next evening, and Clive made a group announcement asking for 3 volunteers to help crew the boat – within an hour or so, he had 12. We would return to the lifeboat station the next afternoon to brief the boat crew and make any final preparations. The next morning we visited Bristows SAR base at MOD St Athan to brief the aircrew and prepare the two Freds for the trial that evening. Having conducted the majority of the ground-based testing at St Athan in 2018, the helicopter crew led by Captain Al Dale were already familiar with the project and the aims of the sea trials. As Jim reported in the previous blog, a previous attempt to gather data in the Bristol Channel was curtailed when the aircrew were called away to attend a real search and rescue job. Over a cuppa with the crew (you’ll notice the continuing theme here) Jim and I discussed the specifics of the night-time search procedure, the search area, the weather forecast, and established a working radio frequency so that we could coordinate the search from the ground/boat if required. Satisfied with the plan, we headed back to Port Talbot. Back at the lifeboat station, preparations had already begun. Several crew, many of whom work at the famous steel works which dominates the town, had already clocked off and were busy preparing the small D-class rib. Weight restrictions would permit only one of Jim or I to be on-board for the trials. Jim, having assessed the enormous waves, volunteered me. Helmsman Kyle James issued me with a spare immersion suit, lifejacket, and helmet, then proceeded to give me a quick safety brief. I would need to kneel down at the front of the boat (there are no seats) and push myself down into the boat using the straps to avoid being thrown into the drink. These guys are very experienced and I was reassured that I was in good hands. Myself, the two crew, and the 'Freds', hopped aboard and we were towed down the lifeboat ramp to water’s edge by a tractor. Having waited on the beach for a brief respite in the waves, the launch was brutal. We accelerated hard to get beyond the breaking waves as they pose the greatest risk of capsize. After every wave crest we were launched airborne, hitting the water hard in the intervening troughs. The maritime report predicted a WMO sea state of 6, corresponding to 4-6m waves – they were not wrong. Once we were about half a mile out to sea, the waves turned to swell and we were able to turn 90° and transit parallel to the shore to the search area. We deployed the first Fred, unceremoniously tipping him out the boat, and returned to the shore of the ‘small side’ – a sheltered bay at the outlet of the river Afan. From here we could re-launch the boat to recover/deploy Fred more safely than the main lifeboat ramp. Shortly after reaching the shore, a radio message from the chopper informed us that they were inbound, ready to begin the search trials. The search trials went well despite the conditions, with the aircrew managing to locate Fred on each run. The data revealed that the Fred wearing our modified immersion suit was spotted, on average, from approximately twice the distance as the Fred wearing the current regulation suit – exactly what we hoped to find. The pilots also commented that with the modified suit, there was an ‘obvious glint from the additional reflective tape, which was visible on both NVGs and the FLIR camera’. The benefit of the additional tape was also inadvertently demonstrated to us on the ground. The helicopter and lifeboat activity had attracted quite a crowd on the shore (they were reassured that it was just a training exercise). One member of the public parked his car in the harbour carpark and directed his headlight’s main beam to provide light for the lifeboat crew on the beach. Although not exactly helping with what we were trying to achieve with our trials, for the few minutes the lights were on, the Fred wearing our modified immersion suit, probably a mile out to sea, was lit up like a Christmas tree. It wasn’t until this moment that I had truly realised the capability of this remarkable reflective Orafol Oralite material. The images from the FLIR camera below suggest that the aircrew had a similar view from the air. Having declared a job well done, we tidied up all of our toys and headed back to the lifeboat station to clear down. My knees, back and neck were shot, but I’d managed to stay in the boat, the right way up, and wasn’t sick. We debriefed in the ops room, looking over the sea still crashing below in the darkness. Clive and the crew presented me with some RNLI souvenirs for my heroic efforts that evening, and a can of beer from the fridge. What a great bunch! Jim and I returned to Cranfield the next day having dropped by the helicopter base to download the video footage from the aircraft’s FLIR system, and collect the flight test cards from the crew. We would spend the next 2 weeks writing up the results and planning the third and final trial. That’s all for now, but the second part of the blog post will be available in the next week or two - where the final sea trial would take us to the Isle of Lewis via a quick connection in Glasgow. To find out more about what it might be like to study a Transport Systems course at Cranfield University, check out the video below.